This is a truly ancient instrument. Michael teaches many styles of music for the hammered dulcimer, as well as techniques for rhythm and hammering. Michael also teaches arranging for this instrument in accompaniment and contrapuntal style. Dulcimer means ‘sweet song’ and this instrument — as well as the fretted version — certainly do justice to this name. This dulcimer, teardrop or hourglass in shape, sits on the lap and is strummed with the right hand and fretted with the left. 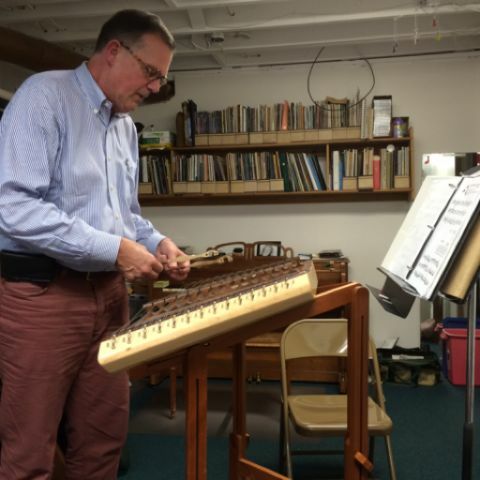 Michael teaches many styles of music and tunings for the fretted dulcimer. This is a true American instrument. Dulcimer means ‘sweet song’ and this instrument — as well as the hammered version — certainly do justice to this name.